Why building relationships is important and how you can create strong bonds with people you work with virtually! Working from home has progressed from being just a trend to a more viable and respectable option for many Global organizations today. Being a strong proponent of work-life flexibility and virtual workplaces, I believe it is a true win-win situation wherein company can save costs while keeping their hard- to –find talent in places other than mother ship and skilled professionals turn to become happier employees having luxury of working from home without the hassle of relocating or commuting to pursue their dream job! Happier employees are positively associated with good retention rate, increased morale and continued success for the company! However working remotely is not easy and requires a certain set of temperament and skills to succeed as Virtual team member. This article will be a part of #RemoteWorking series and will cover the importance of workplace relationships and simple strategies to build trust while working virtually! Before we go into “how”, let’s start with “why” it is important to foster workplace relationships even when working remotely! Developing high quality relationships have been positively connected to increased productivity and feeling psychologically safe at work. People, who have strong workplace friendships tend to feel less isolated, more focused and loyal to their company, get sick less often and do not change jobs frequently. But given all the benefits of having high quality workplace friendships, it is imperative that virtual employees must make a deliberate effort to build relationships. Here, in a remote working situation the interactions are much more purposeful and require greater effort unlike people who work in office where networking happens naturally when you meet your coworker down the hallway or by water-cooler and brainstorm a work problem along with discussing weekend plans! So is it possible to still build strong connections, foster meaningful workplace friendships while working out from your home? Answer is yes! Here are some simple strategies to build meaningful virtual work relationships! This is where the romantic idea of working at your own pace breaks down as it is very important to be available to your team when they need you. When your team does not see you on a daily basis, they will feel uneasy and this may cause concerns about your ability to meet Project deadlines. You have to be accessible during the core work hours and build trust with your team by constantly delivering results and being available to answer any last minute escalations. 1. Core hours– It is important to establish your core hours, blocks of time in which you will be present and available to your team which is usually 8 hours but can vary according to your company. Set expectations that outside core work hours, team can expect a delay in response. 2. Socialize your schedule with your team/clients– One of biggest perks of working remotely is the flexibility that will allow you to run quick errands or have midday appointments and yet be able to meet your work day’s goals and commitments. In such situations, it is always recommended that you should socialize your schedule with your team so they are aware that you have stepped out. Always give a heads up to the team for any possible delays and be transparent with your commitments. Being truthful is far easier than trying to juggle multiple commitments while appearing to be present! Normally in an office setting, employees tend to relate to each other and bond over coffee/lunch, or during small talks in parking lots or break-rooms. This kind of personal chit-chat helps employees to trust each other and help each other succeed in the job. However, while working remotely since networking does not happen naturally, employees need to make time and effort to make informal conversations with their colleagues/team. Simple 2- minute informal conversations either at the start of group meetings, following up with a colleague how their vacation was , checking on someone who was out sick , sharing family pictures, wishing someone on their birthday – all of these simple gestures will definitely help break the ice and let your personality shine through virtually and strengthen your relationships! 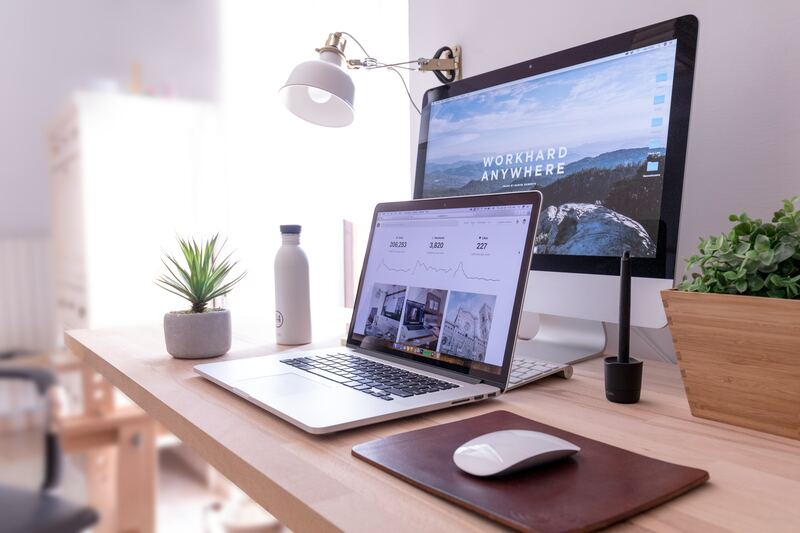 Today we have numerous tools to stay connected due to technological advancement which has made our life and work much easier than ever before. Using easily available services like Lync, Google Hangouts, Skype and other tools, it is possible to create strong interpersonal relationships among remote employees. Remote workers should also use Video option during meetings whenever possible to gain more visibility. Using Video helps put a face to your name and hence becomes easier to build rapport over time. Also unlike the regular conference calls, which may trigger you to your twitter or email distraction, enabling video during calls will make you more focused and participate more in meetings which will in turn build rapport over time. Also make sure you “dress the part”; wearing appropriate office attire during Video calls shows your commitment to the company and helps build trust with the team. In the absence of physical interaction, use social media to effectively engage with your network and keep the virtual communication ongoing by liking/sharing posts, offering feedback on other’s posts and stay connected with your network. Agreed there is no opportunity to meet your coworkers face to face and hence bonding will be harder; however there are still ways to stay connected and make your relationships stronger if you communicate accurately and at a regular basis. Second, make sure you have a proper agenda for your meetings with an intended goal and share your notes, socialize the common objectives across the team to establish a shared vision for the team. Third, Pick up the phone! One of the pitfalls of virtual relationships is the overuse of written communication and possibility of misunderstanding the message leading to workplace conflicts. To avoid these, even though email is an easier tool to use, pick up the phone if the topic is complicated. In this global economy, it has become common to work across different time zones with teams residing across continents which make it even more challenging to build trust. While working across boundaries sometimes, conflicts arise because of clash in values, working methods, different identities and inter-group prejudice. However in the best interest of the company, these issues can be resolved quickly by taking simple initiatives like considering other team’s time zones while setting up meeting, making an effort to pronounce the difficult names accurately, learning how to greet in the local language, celebrating each other’s festivals/holidays. Be mindful of differences and always be respectful of each other’s culture. More than just freedom and flexibility, working remotely is also about personal empowerment. Use that power to learn more about the company you work for, ask to be included in decision making process and volunteer to take on additional responsibilities. Volunteering will give you more visibility, helps you learn new skills or master a new technology, it will increase your connections across the company and helps build relationships with cross functional teams! When given an opportunity to visit your client or team and travel onsite, take the offer! Getting face to face time with people you work helps to overcome communication barrier and facilitates smoother conversations. Compare it to human courtship of sorts wherein you feel nervous and formal first time and subsequently by being open and honest with each other, relationship gets stronger! Similarly work relationships get better once the employees know each other better and understand each other’s working methodology; they can coordinate better on business related activities and make joint progress towards achieving company objectives. More importantly meeting your team will help seal the relationship with your boss and coworkers who will in turn try harder to incorporate you into fabric of the company! So yes, it is possible to build and maintaining resilient relationships even when you work remotely! It does require some deliberate effort and planning, but with the above mentioned tips, and with right attitude and collaborative tools, you will no longer be just another name in email chain, you will have a strong presence, you will be an influential voice in the team and will share the same bond as those who work in an office setting! Try these strategies today and share what worked best for you! Are there any other ways to build resilient relationships while working virtually? Share your insights in the comment section below.